Today is Friday, January 11, 2019. 33 days until pitchers and catchers report for Spring Training! Our new table was successfully delivered and assembled yesterday afternoon. It’s quite nice, and looks exactly like the one in the store. C sent me some pictures of the ones she was considering, and we selected this one together. We already had the cat. That’s Rocky (short for Rachmaninoff), checking out the new table. When I was moving the old one out to the garage, yesterday morning, I had moved all the chairs out, and came back to find him walking around on the table with a most concerned expression on his face. It was as if he were saying, “What on EARTH are you DOING? ?” I assured him that we would have new one later in the day. I had a productive day, as well, getting music set up for Sunday, taking a look at one song that I’m supposed to play at an upcoming wedding in February, getting dishes done, AND putting away two loads of laundry!! So I did not do nothing but sit around and play Red Dead Redemption 2 all day. I did a lot of that, but I did some other things, too. Then I cooked dinner, too! 1. For our new table and chairs. 2. For God’s “inexpressible gift,” mentioned in that verse. 3. For the songs I will be leading at our worship gathering, this Sunday. 4. That the leadership of our church trusts me enough to leave the music in my hands for Sunday. be honor glory throughout all ages. Amen. Finally, he erected the Courtyard all around The Dwelling and the Altar, and put up the screen for the Courtyard entrance. The Cloud covered the Tent of Meeting, and the Glory of GOD filled The Dwelling. First we see that “Moses finished the work.” The tabernacle, the dwelling place of God in the presence of the Children of Israel, was completed. This represents the service that man brings to God. About a year ago, we began to think of our worship gatherings in terms of us worshiping God, but at the same time, picturing God walking among us, back and forth between the chairs, ministering to us, working in our lives. This is the kind of rhythm we are talking about. I used to think of worship as a sort of performance, man worshiping while God sat on His throne, taking it in. I no longer see it this way. I see it more in the rhythm of which Peterson speaks, here. Father, I am grateful for the beauty of this rhythm in worship. I look forward to practicing and observing this on Sunday morning. Today is Monday, February 27, 2017. Eleven days until our Glen Rose weekend! Shunpike ~ a side road used to avoid the toll on or the speed and traffic of a superhighway. Today is Kahlua Day. I learned something today. Kahlua was invented in 1936 by Pedro Domecq. It is a mixture of rum, vanilla, corn syrup, and coffee. I’ve never drunk it straight, but I know I love it in the fudge that C makes every Christmas. There aren’t enough words to tell you how much fun we had in The Secret Chambers Escape Room yesterday! As noted yesterday, we did the Cthulhu Chamber room, where our objective was to find five idols and the Necrinomicon, thereby stopping the arrival of Cthulhu and his wrath. We had 60 minutes to do this. We completed the challenge with nine minutes and twenty-four seconds remaining, with a minimum amount of help from the room attendant, who was playing a role in the mystery, as well (albeit from outside our locked room). We were also complimented by the staff on our “energy” as we worked the challenge. There were at least five different boxes that we had to unlock, some with up to three locks on them, some combination, some keyed. There was also a fireplace that we had to open, as well as a secret upstairs chamber that had to be unlocked. Drawers had to be opened, phone and typewriter puzzles solved, and a crazy skill game involving a clock. The clock game and the upstairs chamber both required at least two participants. We all worked together very well to solve all the puzzles. We will definitely go back soon for the Pirate Chamber. After the escape room, we decided on Riscky’s BBQ on Camp Bowie for lunch. It was a scrumptious conclusion to our outing for the day. We even got some bread pudding to take home for dessert, which we at as we watched a couple of TV shows that R & J like. It was a wonderful day. Today, of course, it’s back to the “grind.” And I will, unless providentially hindered, finally make it back to band practice. Oh! I almost forgot! Here’s a picture that a staff member of The Secret Chamber took after we finished. Thirty-five days until Opening Day! Habits that we have learned from others, in some cases even parents or other family members, negative character traits, can, in the hands of our God, “be molded for our good.” Evil spoken against us, lies, attacks from enemies, can become our weapons, when shaped by the hands of our Father. Father, I confess that I have experienced anxiety over words spoken at work. I confess the sin of not trusting in you to make things right, to vindicate me. I know that you are in control of all things. As I continue to do the job you have placed me in, give me the strength and faith to do it to the best of my ability for your glory and your glory only. Good morning. It is Sunday, June 1, 2014. 20 more days until the first day of Summer. Today is Say Something Nice Day. So everybody try to only say nice things today. I’ll see how long I can go. . . Yesterday was a pretty good day. Christi made breakfast for lunch, which was, as always, delicious. We relaxed until church time, then went up to where our church meets, got things set up, then had our prayer gathering. The worship service was very nice last night. I think it all was very good. As the music was going on, I was thinking how nice the simplistic setting was (two acoustic guitars, a leader, and one background vocalist–three people). No, it wasn’t what you might consider to be “dynamic,” by any stretch. Most of the songs had the same feel and tempo. But that’s not what it’s about. It’s about directing our attention to God, and worshiping him, and that’s what happened. The sermon was an overview of the second chapter of Ruth, and was very good. It centered on Ruth’s actions and attitude, after losing everything she had and moving to a totally foreign country. Instead of sitting around, feeling sorry for herself and demanding something from God (entitlement), she went to work, confident and expectant that someone would take notice and show favor to her and her mother-in-law, Naomi. Sure enough, she “just happened” to find herself in the fields of Boaz, a distant relative, who did, in fact, show favor to her. At that point, she was very humble. So the points of the message were that there are three responses that we should have when tough times strike us. We should 1) walk confidently, 2) walk humbly, and 3) walk expectantly. Today, I believe Stephanie has an outing to the horse farm planned with her friend, Summer. While that’s going on, we will probably do grocery shopping, and who knows what else. The rest of the day will be resting up for the week ahead. Christi should start the process for the new job sometime this week. She’ll have to do another background check and drug test. Unfortunately, they can’t just share the one from the other job. Oh, my. I just realized that this was forty-seven years ago. his God—his way is perfect; the word of the LORD proves true; he is a shield for all those who take refuge in him. In recent weeks, the part of our worship service that has become most meaningful to me is The Supper. Some call it Communion, some call it The Lord’s Supper. For our little community of faith, it is a time of response in each week’s worship service. And yes, we have it every week. Our pastor decided that this should be done, a few months ago. There is much discussion on how often we should observe The Supper, but it is all pure conjecture, because Jesus did not instruct us as to the frequency, only that we were to do it in remembrance of him. But during our observance of The Supper, we are admonished to think about several things. First, we are to, as Jesus instructed, remember the sacrifice that Jesus made for us. Then, we are admonished to, as Paul stated, discern the body. Our pastor’s interpretation of this is that we must, before taking The Supper, consider our relationships within the body. If we have anything against anyone who is there, we are admonished to take care of this and make it right before partaking of the bread and wine (or grape juice, depending on the individual’s preference). I have had some very meaningful moments over the past few weeks, as I have spiritually and emotionally prepared myself for the act. It has most definitely been the high point of the last several worship services. Whatever your church’s practice in this matter, I encourage you to consider these things the next time you partake of The Supper. Reflect upon the sacrifice made for us, and then consider your relationships within the body. I dare say, your experience with The Supper will be heightened. Father, I thank you for the sacrifice of Jesus Christ. I thank you for the weekly observance of The Supper, and what it means in the lives of believers everywhere. I am encouraged by the thought of believers in many cities and countries, taking Communion “together,” whenever they observe it. 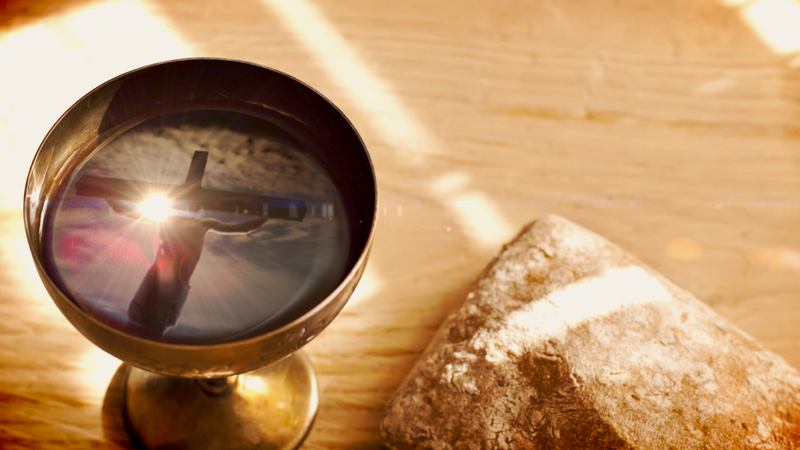 As we partake of the body and blood of Jesus Christ, in whatever tradition we profess, I pray that we would also partake of his righteousness and holiness, these attributes that you have imputed unto us through his sacrifice. It is a beautiful observance, and I praise you for this. I thank you for this day of rest, and pray that we would be well-rested for the week ahead. I thank you for this new job offer for Christi, and what it will mean for our family. Help us to be responsible with this blessing and to be generous with the resources you have given us. I pray that Stephanie will have a good time with Summer as she goes to see two new baby horses, and then to have lunch with them. Terry and Summer, not the horses. Let Them Thank the Lord for His Steadfast Love! Good morning. It’s Saturday, September 15, 2012. Gotta hurry this morning. Going to do setup for The Exchange at 800am. Or, should I say, we’re going to do setup for God? Because, truthfully, that’s who we’re serving. Today is “National Felt Hat Day.” And I just happen to have one of those! Perhaps I’ll wear it (if I can get all the dust off of it). On this date in 1954, this famous picture was made. 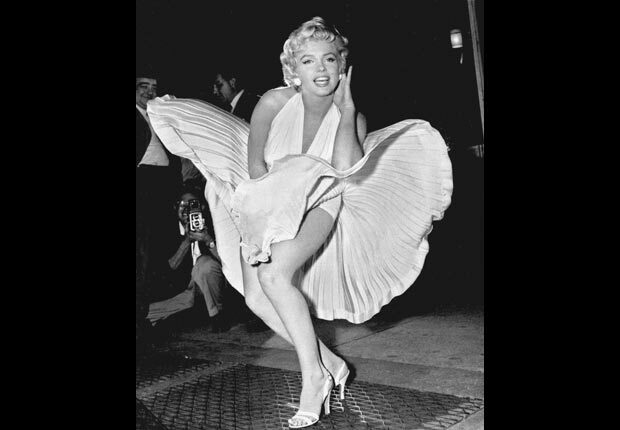 It was made during the filming of The Seven Year Itch. On this date in 1890, Mary Clarissa Agatha Miller was born. Of course, most of us know her as Agatha Christie, possibly the most famous of all mystery authors. Father, I pray that you teach me something in the little time I have this morning. Today, I’m reading Psalm 107. This lengthy psalm speaks of the troubles and redemption of the Lord’s people, and begins with a rather famous line. “Let the redeemed of the LORD say so.” NOT, “Let the redeemed of the LORD say, ‘So! '” I always thought that was a silly song. If we are redeemed, let us proclaim it! This section dealt with people wandering in the wilderness. The psalm closes out with verses 33-43. By his blessing they multiply greatly, and he does not let their livestock diminish. Let us give thanks to the Lord for his steadfast love, for his wondrous works to us! Father, I’m out of time this morning. I give you thanks and praise for the wonderful works that you have done in the life of my family and me, and those surrounding us in your church. You have delivered us out of many troubles, just as your Word tells us you will do. You are a God who keeps his promises and does what he says he will do. I will praise you for the rest of my days with all of my breath. Let everything that has breath praise you for your mighty deeds, O Lord! I apologize for the brevity of today’s entry. Or perhaps you like that better. In which case, you’re welcome. 🙂 I hope you find a reason to give thanks to the Lord today! Good morning. It’s Sunday, August 5, 2012. My Hallmark Ultimate Holiday app says that today is “Work Like A Dog Day.” I’m not sure I like that, considering it’s Sunday. However, their suggestions include things like begging for treats and burying your favorite toy. That kind of “work,” I can approve. Could someone throw me a cookie or something? On this date in 1983, the movie Risky Business debuted, launching Tom Cruise to stardom. On this date in 1957, American Bandstand began broadcasting nationally. And on this date in 1944, Polish insurgents freed 348 Jewish prisoners from a German forced-labor camp in Warsaw. They joined together in an uprising against the German occupiers in the city. We had a blast at Hawaiian Falls yesterday afternoon. Armed with 100+SPF sunblock, we went down several slides and made about five runs around their “lazy river” (they call it something else, but we all call it “lazy river”). The best slide is one that has a two-seater tube and launches from two different entrances at once. Both sets of people wind up sliding around this large bowl in the middle and there are two different exit holes at the bottom of the bowl. Christi and I went around the large bowl at least four times. It was great fun. Some of the other kids latched onto Stephanie while we were waiting in line for the first slide, and she spent most of the afternoon with them. I was glad to see that. We only stayed about three hours, but were exhausted afterward. Thanks to the leadership of The Exchange for organizing this event! This morning, we get to serve by running tech back stage for the worship celebration. But we don’t have to be there quite as early today, because there is no band, just an acoustic guitar. Since we had “Extreme Nights” this week (our version of VBS), they kids will be singing some songs during worship time. I believe Stephanie’s boyfriend Scottie will be coming to church with us. Father, please give me a glimpse of your face as I read and pray this morning. Today, I’m reading Psalm 66. In this psalm, the unnamed psalmist calls upon all to “come and see” the great works of God. A lot of people interpret verse 18 to say that if you have “unconfessed sin” in your life, God will not hear your prayers. I do not believe this. For one thing, there’s a good chance that I always have “unconfessed sin” in my life, as I may have committed a sin an not realized it. Not all sin is intentional, right? I believe the key word in verse 18 is “cherished.” “If I had cherished iniquity in my heart…” If I love sin, God won’t hear my prayers. That makes sense. Because if I’m loving sin, I’m not loving God. Father, help me to trust. We addressed this yesterday. I don’t need to know what is going on in my life. I simply need to trust that you have it under control, and that you are working your purpose out in me. And with me. The desire of my heart is that I be useful to you. I bring you nothing of my own that is of any value. All that I have, you have given me. Any talent that exists is a gift from you. I pray that your Spirit will help me use those talents to your glory. I confess…I’ve been sitting on them for a while. They’ve been buried in the ground, so to speak. Not out of fear, though, more out of complacency. Or just waiting, perhaps. But while I’m waiting, I need to be prepared, don’t I? So I will start preparing for something, even though I know not what. Keep me praying. I believe that this is part of your purpose for me, and daily, new prayers are coming in. I will be faithful to pray for these things as you bring them to my mind. As I leave the house, now and head to church, I pray for our worship celebration this morning. May we worship you in spirit and in truth. May the words spoken by our pastor be words from your Spirit. Open our ears to hear what the Spirit has to say to us. May we glorify you in all things. What is God’s purpose for you? Trick question…you don’t need to know. Just know and trust that he is working it out.